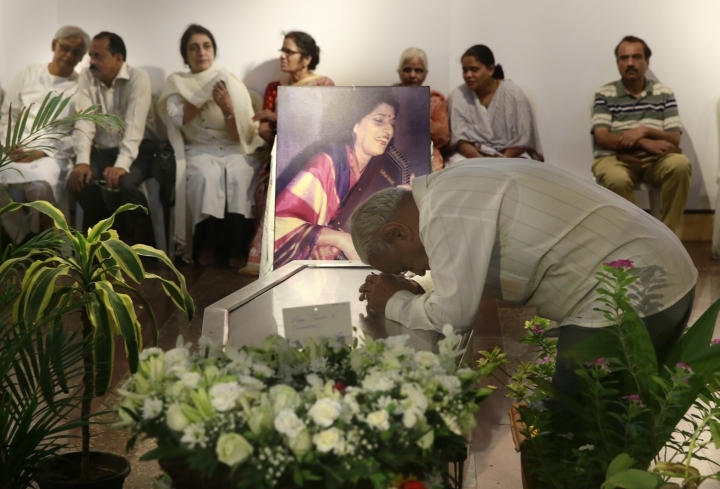 NEW DELHI — Singer Kishori Amonkar, renowned for her innovative interpretation of classical Indian music, has died, one of her students said Tuesday. Amonkar, 84, died late Monday at her home in central Mumbai after a brief illness, said Gandhar Bedekar. Music students in India often live with their mentors, and Bedekar's mother was one of Amonkar's oldest disciples. One of the leading lights of the Jaipur "gharana" or community of musicians, Amonkar was trained by her mother, Mogubai Kurdikar, who was also a well-known singer. Amonkar developed her own distinctive style, drawing on influences from other schools of Indian classical music. She broadened the sweep of the Jaipur gharana, with a repertoire that included light classical songs set to traditional ragas, devotionals and even lent her voice to film music. For this she was criticized by purists, but her soulful renditions earned her millions of fans across India. Musicians, artists and political leaders tweeted tributes to Amonkar. The "demise of Kishori Amonkar is an irreparable loss to Indian classical music. Deeply pained by her demise. May her soul rest in peace," Prime Minister Narendra Modi tweeted. For her contribution to the popularization and development of classical Indian music, the government honored her with two of the country's top civilian honors.